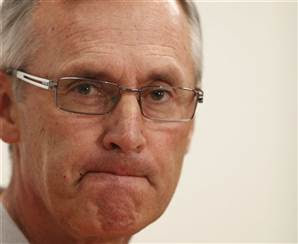 While CFT capably handles biggest football story on the planet, we are left to wonder what former Ohio State coach Jim Tressel will do next. One natural question: How about the NFL? 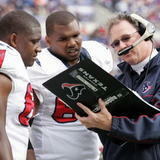 Gil Brandt of NFL.com knows Tressel well and doesn’t think it’s a fit. “You look at all the highly successful college coaches and not many of them seem to translate that to the NFL. I don’t think the NFL is for Jim,” Brandt writes. He believes Tressel is more likely to pursue an unpaid gig at a small school where he can go back to teaching young players and helping coaches. NFL.com writer Albert Breer, letting his Ohio State colors shine, wrote a piece saying Tressel could succeed in the NFL. That may even be true, but it sounds like an unlikely step in his career. Barry Switzer made the transition from disgraced college coach to Super Bowl Champion, but Tressel doesn’t have a buddy like Jerry Jones that owns an NFL team. The quick collapse of the Donovan McNabb era in Washington didn’t come as a total shock. The rise of John Beck this offseason was a lot more surprising. According to Pete Prisco of CBSSports.com, it’s largely been a Kyle Shanahan production. “The son doesn’t like [McNabb],” one source told Prisco. The relationship reportedly never developed between McNabb and Kyle Shanahan, the team’s offensive coordinator. The younger Shanahan reportedly does like Beck, although that doesn’t explain why Rex Grossman started over Beck late last season. “Mike Shanahan listened to his son’s recommendation to sit [McNabb] down, a son who has more power than most offensive coordinators in the NFL, probably because he has the same last name as the head coach,” Prisco writes. We don’t know the situation enough to say if Kyle Shanahan truly holds that much sway. There are plenty of coordinators that have a large say in quarterback decisions. We do know that the next year or two in Washington will mean more to Kyle Shanahan’s career than his father’s. If they turn the ship around, Kyle could wind up being the team’s next head coach. If not, it would be the first major setback for one of the most promising young coaching prospects in the league. Well, we’d been looking for an NFL hook to the stunning-but-not-shocking decision of Ohio State coach Jim Tressel to resign. Thanks to Mike Freeman of CBSSports.com, we’ve found one. Amid rumors that former Florida coach Urban Meyer will be the new coach of the Buckeyes after the 2011 season, there’s a name with strong NFL connections that could enter the fray. Freeman thinks that Gruden will be interested, even if everyone involved issues consistent denials. Although Meyer’s accomplishments at Florida make him a no-brainer, Meyer’s on-again, off-again health problems could make him a less-than-ideal option for a program that prides itself on year-in, year-out consistency. Since Woody Hayes threw a haymaker at Clemson linebacker Charlie Bauman in the 1978 Gator Bowl, the Bucks have had only three coaches: Earl Bruce, John Cooper, and Tressel. So, in the end, the primary factors in choosing the next coach at Ohio State likely will be a genuine willingness to stick around for the long haul — and the coaching skills and abilities to do so. Last year Bengals coach Marvin Lewis criticized the Buccaneers over their decision to pay a practice squad player far more money than practice squad players typically make in order to get him to leave Cincinnati for Tampa Bay. 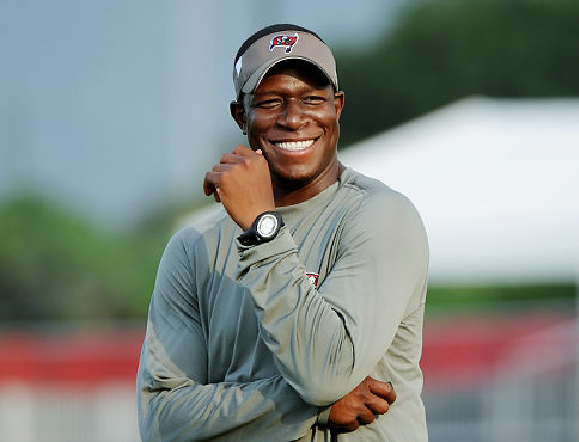 But while that incident suggested that Lewis doesn’t like the way Bucs coach Raheem Morris does business, Morris has made clear that he likes and respects Lewis. Morris attended the Marvin Lewis Golf Classic and told the Cincinnati Enquirer that the exchange of words over the practice squad had nothing to do with how he feels about Lewis. Morris said Lewis has been a role model and an inspiration to him. Lewis was wrong to criticize the Bucs, but it’s generous of Morris not to hold that against him. 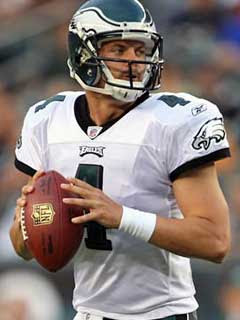 What’s best for Kevin Kolb happens to mirror what is best for the Philadelphia Eagles. So the young quarterback should have confidence he will have a new home before the 2011 season begins. The Eagles have made no secret of their desire to deal Kolb, and because he’s under contract for only one more season, Philadelphia runs the risk of losing him with no compensation if it doesn’t deal him. Kolb showed up for player-run workouts the Eagles were conducting on Thursday. It’s fair to wonder if it will be one of the last times he’s on the field with his teammates. Chances are good he won’t have to worry about backing up Michael Vick in Philadelphia this season. After all, that wouldn’t be best for Kolb or the Eagles. 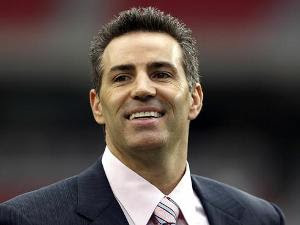 Former Rams, Giants and Cardinals quarterback Kurt Warner believes the lockout is going to end in time for the 2011 NFL season to begin as scheduled. But those on the players’ side may not be happy to hear how Warner thinks that’s going to happen. Warner told USA Today that he thinks it’s the players who are going to have to budge and meet the demands of the owners to get a deal done. Warner’s comments are a bit surprising coming from a player, but they’re consistent with his previous comments that the players got a great deal on the last Collective Bargaining Agreement, and that it’s not realistic to expect to keep that deal forever. So Warner, who left millions of dollars on the table when he decided to retire, thinks the current players are going to have to give up some money, too. 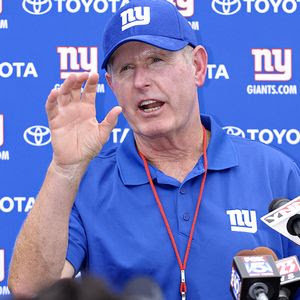 We take a quick detour in what is sure to be a sssslow NFL Friday before Memorial Day weekend to journey into a time where Tom Coughlin was a college football player. Coughlin played wing back at Syracuse in the 1960′s and two future Hall of Famers were ahead of him on the depth chart: Floyd Little and Larry Csonka. Little, who is still close with Coughlin, said the Giants coach was like any backup running back. He wanted the ball more. Apparently, Coughlin would get so upset that it tipped off their opponents. “You knew he wasn’t carrying the ball because he was always mad,” Little said, laughing. We can only hope that a Giants running back will bring up this story to Coughlin the next time they feel underused. 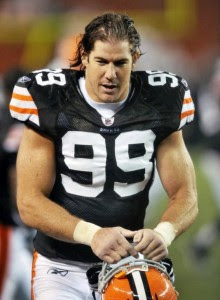 Wednesday’s talk with Browns linebacker Scott Fujita was one of my favorites, and not only because Florio somehow avoided litigation talk for half of it. Fujita does a great job of honestly explaining the viewpoint of the players, while recognizing a deal needs to be fair for both sides. He was asked about the increase in acrimony between the players and owners of late. It was the one part of the interview where Fujita’s passion really came through. 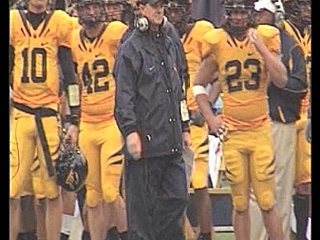 PFT recommends watching the whole segment, including when Fujita defends Cal’s honor, at the PFT homepage. The rules of the road in the NFL during the lockout prevent owners from having contact with players. But there are some exceptions. One exception, Cowboys owner Jerry Jones confirmed today at the NFL’s spring meeting, is that he’s allowed to attend the wedding of his quarterback, Tony Romo. 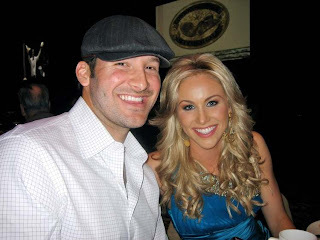 Romo will marry Candice Crawford on Saturday in Dallas. When Bengals owner Mike Brown said this week that Chad Ochocinco should focus on football, Brown threw in a line that he intended as a joke. But now Ochocinco says Brown gave him a great idea when he mentioned snake wrangling. And he’s serious. PFT has confirmed with a source with knowledge of the situation that Ochocinco means it: He has begun looking into taking up snake wrangling, directly in response to Brown’s comments. We’re not sure specifically what Ochocinco will be doing, but anything that involves him handling venomous snakes on television sounds like a winner. Perhaps we’ll see whether he can hold onto a cobra for longer than he can sit on a bull. At a time when guys like Bengals receiver Chad Ochocinco are riding bulls, another player is riding a fire truck. Redskins linebacker Lorenzo Alexander has tried his hand at firefighting. The full report appears on the FOX 5 website in D.C. It’s worth a look. Especially since not much else is happening. Then again, we say nothing else is happening. But we’re still posting 30-plus stories per day. "We don't plan to trade Carson," Brown said Monday at the NFL Spring Meeting. "He's important to us. He's a very fine player, and we do want him to come back. If he chooses not to, he'd retire. 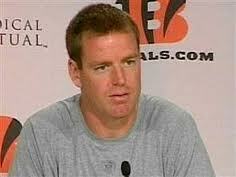 And we would go with Andy Dalton, the younger player we drafted, who's a good prospect. "Ideally, we'd have both of them. That'd be the best way to go forward. If we don't have Carson, we'll go with Andy." Looks like Mike Brown is living up to his stubborn reputation and we'll get to see if Palmer is bluffing or not. It would probably take a big offer to get Palmer out of Cincy, and teams will likely be unwilling to pay too much for the aging (31) Palmer; he produced a career high in turnovers (23) last season and has averaged only 208.1 YPG over his last three seasons. Continuing his regular series of conference calls with NFL season-ticket holders, commissioner Roger Goodell talked to Lions fans this week and attempted to explain why Calvin Johnson’s apparent game-winning touchdown in last season’s opener was ruled in incomplete pass. It’s safe to assume nothing Goodell said will satisfy the folks in Detroit. Whatever clarification is added to the rule book, there still seems to be a great deal of confusion — even among NFL officials — about what, exactly, constitutes controlling the ball long enough. It’s no surprise that one fan told Goodell on the conference call that the NFL’s rules on what constitutes a catch don’t pass the smell test. Goodell, however, said he disagreed with those who say most fans can’t figure out the rules on complete catches. But the truth is, it’s not just Detroit fans who think the “Calvin Johnson rule” stinks. The NFL’s inability to get all its officials on the same page about what constitutes a catch wasn’t just a problem for the Lions. As Bill Belichick said earlier this week, you can forget about OTAs and minicamps this year. There’s a good chance training camp will be limited too, and that means coaching staffs around the league are adjusting their plans. According to Jets G.M. Mike Tannenbaum, there will be a fundamental change in how the Jets approach games. Tannenbaum told Jenny Vrentas of the Newark Star-Ledger that the Jets will likely be more “game-plan specific” on offense and defense, especially early in the year. The Jets expect to dial back their playbook. With a foundation of two years in Ryan and offensive coordinator Brian Schottenheimer’s systems, the Jets’ veteran-laden squad should be able to handle the lockout well. They will need to be ready early, with road games in Oakland, Baltimore, and New England in Weeks 3-5. Defensive tackle Pat Williams‘ contract is up with the Vikings, and many have suspected he’d land elsewhere as a 38-year-old on a team trying to get younger. But the door isn’t completely shut. Williams spoke to reporters at teammate Ray Edwards‘ boxing match Friday night, and said he’s now “50-50” to re-sign with Minnesota. Williams revealed that coach Leslie Frazier contacted him during the brief lockout lift late last month and indicated he’s still part of the Vikings’ plans. 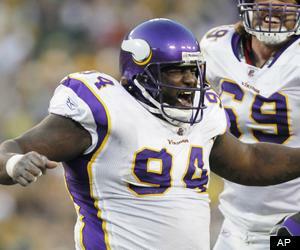 Williams also told reporters that he’s “soured” on the Vikings’ front office. But Frazier and Williams were able to “get some stuff straight” during their conversation. The Vikings annually have one of the NFL’s stingiest run defenses, in large part because of Williams’ massive presence in the middle. The team’s alternatives to Big Pat include Letroy Guion, Jimmy Kennedy, and rookie Christian Ballard. In theory, the Vikings might love to start rookie quarterback Christian Ponder on day one and let him learn on the job. In reality, the team may only have three weeks to get ready for the season and playing a rookie quarterback could be unrealistic and ultimately harmful to the kid’s development. The Vikings can’t assume anything about Ponder until they see more of him and they’ll have to get some veteran alternative. ESPN’s Chris Mortensen write that Minnesota plans to add a veteran and Orton is on the team’s radar. Orton is a sensible target for teams like Minnesota, Tennessee, or Miami that want competition at quarterback or a bridge to a rookie quarterback that may not be ready to play well in 2011. 23-year-old NFL hopeful Nick Schrank of Centreville, Virginia appeared on The Tonight Show with Jay Leno for the program’s “Does This Thrill Bill?” segment on Wednesday night. Bill is William Shatner. And Schrank successfully thrilled him with a standing jump onto a medicine ball positioned atop a 40-inch bridge. Here’s a link to the trick. Schrank played linebacker and defensive line at George Mason, which faced D-2 opponents but is characterized as club-level football. He is 6-foot-2, 225 pounds, and runs in the 4.7s with a 33-inch vertical leap. So Schrank has won over Bill Shatner. Almost every team has undertaken some sort of player-organized workouts at this point. Michael Vick and the Eagles were the latest to jump aboard on Thursday, according to Sal Paolantonio of ESPN. The workout reportedly included 15 players, with most of the team’s core skill position players in attendance including Brent Celek, Jeremy Maclin, and Jason Avant. Vick organized the workouts, which are taking place at a remote location in South Jersey. Perhaps they’ll run into these guys. Bowers said that he is beyond motivated to show that he is healthy and to prove to the teams that passed on him that they made a mistake. Buccaneers general manager Mark Dominik told me that the snub clearly has made Bowers hungrier, and coupled with his love of the sport, Bowers' intangibles could make him an even better player than anyone expects. 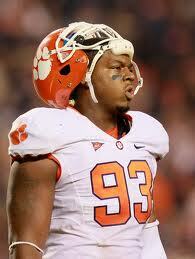 » He didn't know that his knee injury was problematic until he realized he couldn't participate at the combine. A red flag went off in his mind, as it did with several teams. » Bowers didn't know the extent of his knee procedure until repeatedly hearing some of the reports about the surgery. He thought he was simply having a minor scope and even though doctors told him they had to do additional work -- there was a minor micro-fracture procedure -- Bowers didn't know how serious it was. Surely the Bucs knew this when they drafted him, but the fact the word "microfracture" is finally being said is not a good sign. While Bowers may recover, players have a poor history of returning from such injuries, and it could very well limit his ability to make an impact this season. Redskins (for now) quarterback Donovan McNabb absorbed a one-two punch last week, the first from Bernard Hopkins and the second via an intriguing report that McNabb refused to wear a wristband containing the team’s offensive plays. His agent responded to the latest Hopkins howitzer; to date, neither McNabb nor his agent acknowledged the wristband story. On Wednesday, McNabb addressed the wristband issue, refusing to say whether he refused to wear a wristband, according to Mike Jones of the Washington Post. Instead, McNabb called the story “amazing,” and he expressed confusion as to why rumors and criticism continue to follow him. As to whether that effort to make sure he’s ready included a refusal to wear a wristband that could have made him even more ready, we’re left to infer that, by saying nothing, McNabb said it all. After not selecting a quarterback in April's draft, Washington Redskins coach Mike Shanahan talked glowingly of backup John Beck. In a radio interview Monday, Beck made it clear he thinks he's ready to take over as the team's starter. "I believe I'm a starter in the NFL," Beck said in a SiriusXM NFL Radio interview Monday. He's certainly thinking like a leader during the lockout, calling teammates to organize workouts since players are not permitted to train at team facilities during the work stoppage. "I basically say, 'Screw the awkwardness.' 'I'm trying to be the starting quarterback," he said in the interview. "I'll call whoever, try to set whatever up. If you don't think like a starter and act like a starter, your teammates probably aren't gonna believe you're the starter. So I'm thinking I'm the starter." 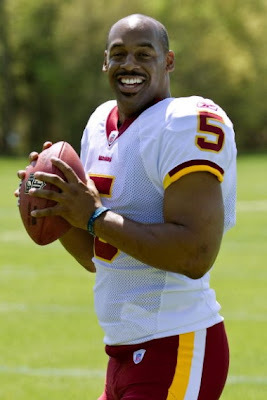 Of course, the reason Beck is even getting the opportunity to start is a result of Donovan McNabb's disastrous first season with the Redskins after being acquired from the Philadelphia Eagles. McNabb was benched at the end of the season for Rex Grossman, who is scheduled to be a free agent once the lockout ends. 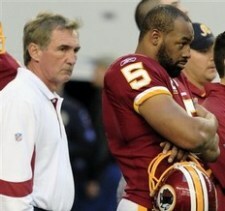 The Redskins are expected to try to trade McNabb. Beck said he likes McNabb but he is glad the quarterback situation played out like it did in Washington late last season. "I have to say I'm glad it happened," Beck said of McNabb's demotion. "If I want my opportunity, I have to have stuff like this happen so I can get an opportunity. 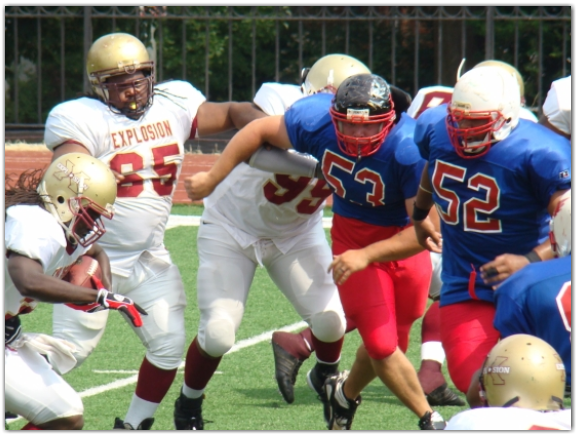 If McNabb stays as starter of the Washington Redskins, I remain a backup, and I want to be a starter. So, I have to hope for things like this to happen." The 29-year-old Beck was drafted by the Miami Dolphins out of BYU in 2007 as their potential franchise quarterback. 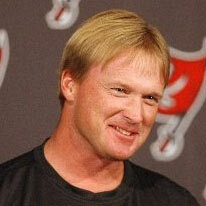 He played in five games (four starts) during Miami's 1-15 season; however, he was the third-string quarterback in 2008. 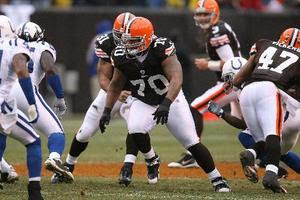 He signed with the Baltimore Ravens in 2009 after being released by Miami and was traded to Washington last year. The Redskins signed Beck to a three-year contract worth $3.35 million last season that keeps him under contract through the 2012 season. In April, Shanahan said he had Beck rated as the best quarterback available in the 2007 draft. JaMarcus Russell, Brady Quinn, Kevin Kolb, Trent Edwards, Drew Stanton and Troy Smith are some of the other quarterbacks who were drafted that year. "I had a lot of confidence in John Beck when he came out in 2007," Shanahan said, according to The Washington Post. "I evaluate the quarterbacks every year, and I do have confidence in John Beck. He was by far my No. 1 guy. I think the world of him." Beck ran the Redskins' scout team last season, impressing Shanahan with his work ethic. "No. 1, I evaluated him throughout his pro career and collegiate career, so I know him quite well," Shanahan said, according to The Post. "And when you see a guy practice every day, whether it's your system or against the defense, surely you can see his strengths and his weaknesses. As I mentioned, I told you what I thought about him in college, and he has not disappointed me since he's been here." Beck struggled in his rookie season, completing just 56 percent of his passes for 559 yards with one touchdown and three interceptions. He also fumbled five times. Still, he said Monday that the experience prepared him to handle adversity. He just asks Redskins fans to give him a chance. "I don't ask any fans to believe in me right now," he said. "How could I? If you try to see what I've done in my career, I've stood on the sidelines and watched people and I went out as a rookie and played like a rookie. That's it." 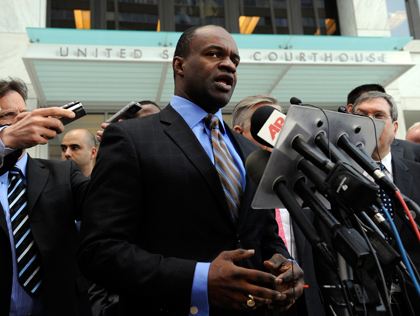 In response to the recent remarks of NFLPA* executive director DeMaurice Smith comparing the labor dispute to a mob war, we suggested that Smith dial back the rhetoric. But now, even with his effort to lift the lockout on the verge of sleeping with the fishes, Smith continues to talk tough. The league hasn’t sued anyone. The league wants to impose economic pressure on the players via a lockout, and the players decertified and filed an antitrust lawsuit in the hopes of blocking the lockout. Today’s ruling that the lockout won’t be lifted pending resolution of the appeal by the Eighth Circuit hardly represents the NFL suing to not plays its game. With a reversal of Judge Nelson’s ruling now looming, Smith’s comments likely have less to do with shaping public opinion and more to do with scrambling to keep the players unified, even if doing so requires Smith to distort the facts in the hopes of playing to the players’ emotions. The problem is that, while such comments may be help keep the players on the same page, they’ll make it harder for the players and the league to ever make it into the same library again. NBC’s Cris Collinsworth dropped a bombshell last week on his Twitter page and at his website, FootballPros.com, predicting that the NFL’s regular season won’t begin until November. The thinking is that the Eighth Circuit will conclude that the lockout should remain in place, that negotiations will get serious after Week One is missed (and the NFL and its players incur the wrath of the fans and the media by not playing on the 10th anniversary of 9/11), a deal is reached within a month, camps open in early October, a single-game preseason is played, and the real thing starts in November. Collinsworth elaborated on his views in a weekend discussion with Peter King of SI.com, including a general observation about the mess that currently exists. The easy answer to the “why?” question is that both sides have opted for leverage over compromise. But that’s really where Collinsworth’s “why?” becomes even more relevant. Why are the players and the owners so intent on getting the best possible deal that they are pushing the sport to the brink of long-term damage? 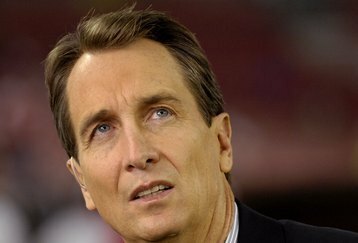 “God, I just wish I could get through to somebody,” Collinsworth added. “You know how when you’re talking to your kids, and you know positively what the right thing to do is, and you also know they’re going to do something else, and there’s nothing you can do about it? That’s how I feel now. And, God, is it painful to watch. Hell, maybe that’s what the hard-line owners secretly want. Maybe Jerry Jones wants to blow up the current system so that he can keep all the money that America’s Team makes and spend as much of it as he wants on the players he wants, in search of the string of Lombardi Trophies that he covets. And maybe Mike Brown is content for the Bengals to be 4-12 each year as long as he can pay the players as little as he wants while still making a tidy profit. It only takes nine owners to block any and all proposals for a new deal, and if only nine owners ultimately want an NFL in which they can run their businesses as they see fit, the other 23 owners and everyone else who cares about the game will have to deal with it. By then, it could be too late for anyone to make a difference. In the wake of the latest one-two punch against Donovan McNabb — a fresh round of withering (albeit misguided) criticism from boxer Bernard Hopkins and a report that McNabb refused to wear a wristband containing the offensive plays last season in order to preserve his image — one writer who covered McNabb’s up-and-down tenure in Philly has offered up an intriguing take. 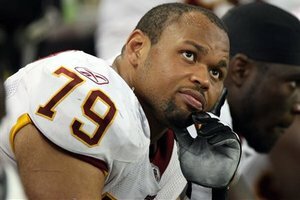 At a time when many assume McNabb will simply land with a new team for 2011, Geoff Mosher of DelawareOnline.com believes that McNabb career could be kaput. “Perhaps there is no worse sign for McNabb than the fact that the Vikings, coached by former Eagles assistant Leslie Frazier, almost tore a biceps tendon reaching for Christian Ponder at 12th overall,” Mosher writes. Though we’re not yet ready to drop a shovel of dirt on McNabb’s 12-year NFL career, it’s a possibility that we no longer would regard as shocking. McNabb will demand being installed as the Day One starter, and he’ll want the kind of financial package that inherently will demonstrate that the Eagles were wrong to trade him and that the Redskins were wrong to dismiss him. At this point, we can’t think of a team that will do it — and we can’t envision McNabb accepting any lesser terms in order to continue playing. Much can change between now and whenever the lockout ends. 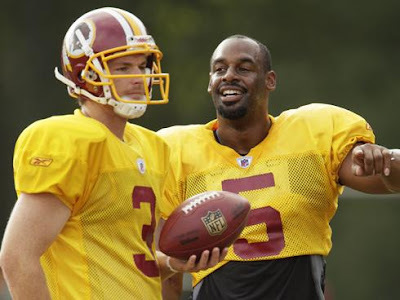 But those changes possibly will have to come as much from McNabb’s view of his current abilities as they will from the needs of the teams who are trying to decide what to do at quarterback in 2011. First it was a brief stint at soccer and now bullriding. 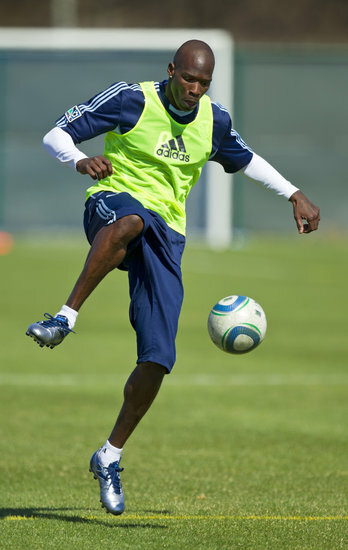 Ochocinco is doing his best to fill the void for NFL fans during the lockout. Before he spent 1.5 seconds on the back of a bull, Bengals receiver Chad Ochocinco suggested that he could be doing it again. After he was thrown from Deja Blu like rain sliding down a steep tin roof, Ochocinco was singing a different tune. “One and done,” he said, per the Associated Press. Ochocinco still earned $10,000 for making it out of the chute, but he fell 6.5 seconds (or, arguably, 7.95 seconds) short of the goal for winning a Ford F-150 truck and the ability to re-name the bull. Because of the lockout, neither the team nor the league can stop Ochocinco from riding a bull or engaging in any other risky endeavors. 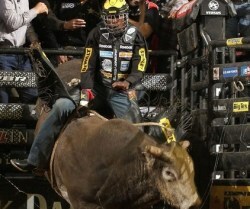 And as risks go there aren’t many larger ones than riding a bull. 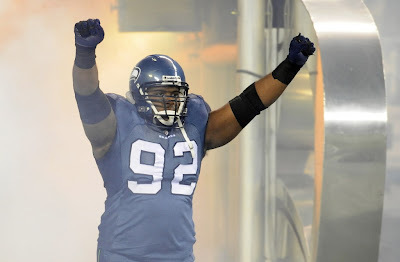 We wrote earlier this offseason that defensive tackle Brandon Mebane could be the most important impending free agent on the Seahawks roster. He doesn’t feel like they treated him that way. Mebane said he never talked contract numbers with Seattle, which is a pretty strong sign they are ready to move on. Then again, they didn’t add anyone to a thin position for the team in the draft and G.M. John Schneider said that would add some “urgency” to bring Mebane back. While he’s had an up and down career, Mebane will be one of the more promising defensive tackles available this offseason. We’d slot him somewhere behind Aubrayo Franklin on the “Most Likely to be Overpaid” free agency list. Plenty of football players are spending the lockout doing plenty of things other than playing football. One football player — to the extent that punters are football players — will be playing football. To the extent that punting amounts to playing football. 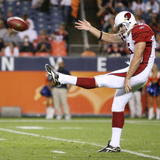 Per the Herald Sun, Cardinals punter Ben Graham will represent Australia in International Federation of American Football world championships in July. Graham’s team has been assigned to Group A, with games against the United States, Mexico, and Germany. Given that the U.S. typically trounces its opponents in these events, it’s safe to say that Graham will have plenty of chances to punt when he faces the Americans. The other countries in the tournament are Japan, Canada, France, and host country Austria. With so much talk in Denver this offseason about whether Tim Tebow or Kyle Orton will be the Broncos’ starter, a third contender has been largely overlooked: Brady Quinn. Chris Mortensen said on ESPN Radio this morning that Broncos front office boss John Elway and head coach John Fox have both told him that Quinn has a real chance of earning the starting job in Denver. Everyone seems to agree that Tebow is the favorite, and it’s more likely than not that Orton will be traded once the lockout ends. But the quarterback situation in Denver is still up in the air, and every quarterback on the roster is still in the mix. 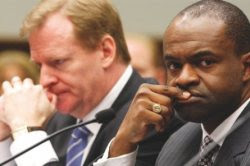 In the latest round of the war of words between the NFL and its players, NFLPA* chief DeMaurice Smith invoked some Godfather-style language to explain why he places the blame for the ongoing labor fight squarely on the owners. 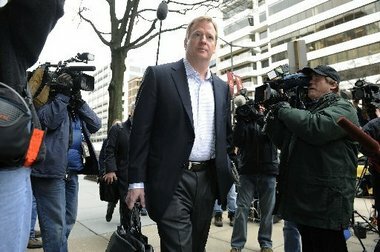 As Smith sees it, the owners have misled the players about the NFL’s finances, and as a result the players have no choice but to fight. Still, Smith insists that the players want to get back to work for those owners. With the lockout lingering (it’ll be nine weeks old on Friday, less the day or so that it was lifted), most football fans assume that there will be no football on Sunday come September. But there likely will be football on Sundays. It just won’t be NFL football. College football surely will take advantage of the vacancy, shifting games from Saturday if Sunday no longer is occupied. When, for example, the NFL shifted the start of the regular season from Labor Day weekend, college football filled the void, with games on Sunday, Sunday night, and Monday night. In a recent interview with KTAR in Phoenix, Pac-10 Commissioner Larry Scott said his conference will be ready to play on Sundays, if the NFL isn’t. “We certainly have an eye on it, and I think we’ll be flexible and opportunistic if the situation presents itself,” Scott said. FOX recently landed the Pac-10 contract, and Gus Johnson has been hired to be the lead play-by-play announcer for the games. So, even without the NFL on Sundays, life will go on. When Matt Leinart was available as a free agent last September, his former coach Pete Carroll didn’t show any interest in signing him in Seattle. That could change this offseason. 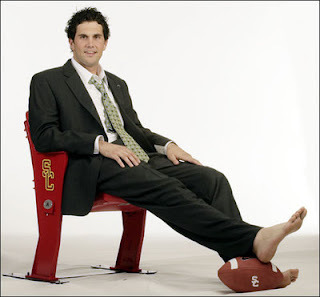 Scott Wolf of the Los Angeles Daily News, who breaks plenty of USC-related stories, hears that Carroll and Leinart have spoken about Leinart joining the Seahawks next season. With Matt Hasselbeck a free agent and no incoming rookie quarterback, the Seahawks have a bigger need at the position than they did last year. Still, the fact Carroll didn’t want Leinart a year ago as a third quarterback says a lot. If the Seahawks wanted to bring him in this year — a big if — we suspect nothing would be guaranteed for Carroll’s former prize pupil. Not even a roster spot. Former NFL quarterback Kordell Stewart, who fascinated football fans in a “Slash” role as a rookie before becoming an up-and-down starting quarterback, has been arrested in Georgia. According to WSB-TV, Stewart was arrested for driving with a suspended license and failure to appear. He was booked into the Alpharetta City Jail. It sounds like Stewart had a speeding ticket or some other minor violation that he failed to properly resolve, which resulted both in the suspension of his license and the failure to appear. To our recollection, it’s the first time Stewart has ever been in any trouble. In the opinion of running back Cedric Benson, it wouldn't be a good idea for quarterback Carson Palmer to return to the Cincinnati Bengals.Rebuffed in a request for a trade, Palmer has said he would rather retire than play for the Bengals again. "It wouldn't be healthy for the team to bring him back," Benson said on Sirius' Late Hits radio program Tuesday night. "To bring him back would be detrimental to the team. If he's there and not happy, he's not gonna give us his best." 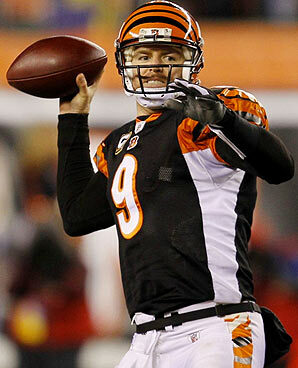 While owner Mike Brown has said over and over again that he fully expects Palmer to return, it seems more likely now that will not occur, as the Bengals selected Andy Dalton in the second round. Broncos executive John Elway doesn’t seem to mind those Kyle Orton trade rumors that are floating around. 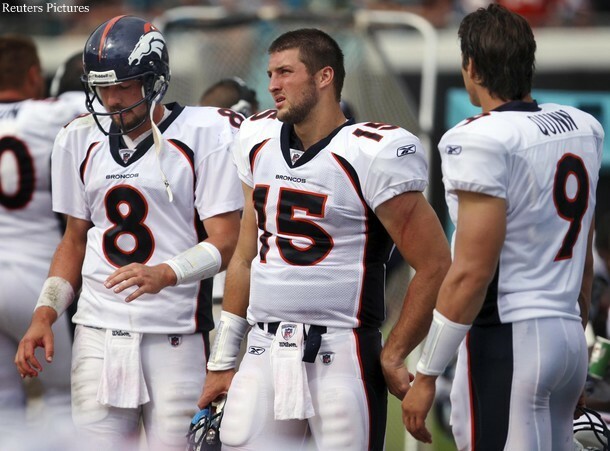 Speaking on Sirius XM radio Tuesday, Elway said it is “hard to tell” if both Tim Tebow and Kyle Orton will be on the team’s roster in Week One, via Lindsay Jones of the Denver Post. We don’t want to give anything away, but Tebow will be there. That leaves Orton, who Elway says will compete with Tebow and Brady Quinn for playing time in training camp. Elway pointed out that the new coaching staff hasn’t even seen the players in action live, so it’s too early to assume anything. His comments make it sound like Orton will be available. Like everything, Denver’s situation is lockout dependent. Let’s say teams only get 2-3 weeks to prepare for the season. Orton would seemingly have a better chance of sticking around in that scenario. As the lockout continues, the players are coming up with new ways to fill their idle time. Seahawks guard Chester Pitts and defensive end Raheem Brock recently filled a chunk of it by creating a video in which they pretend to crank call Commissioner Roger Goodell. Comedy is subjective, so we’ll leave it to the audience to determine whether they think the video is funny. In our view, some of it is and some of it isn’t, which pretty much sums up the full extent of our own efforts to induce laughter. I could see five teams with big wallets going after him: Philadelphia, Houston, Dallas, Detroit and the Jets -- but the Jets ONLY if there's not going to be a salary cap in 2011. See, that's the difficult thing to forecast. If there's a cap, I can't see the Jets in the running, because paying two cornerbacks a combined $35 million a year (or some such lunatic number) would squeeze too many contributing players off their team. Detroit's probably a dark horse, but I wouldn't be surprised if the Ford family, which has to be as excited about its team as it's been since the prime Barry Sanders days, would authorize a big check for Asomugha. 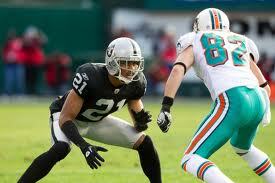 Arguably the best corner in football, he'll make a big difference where ever he ends up. 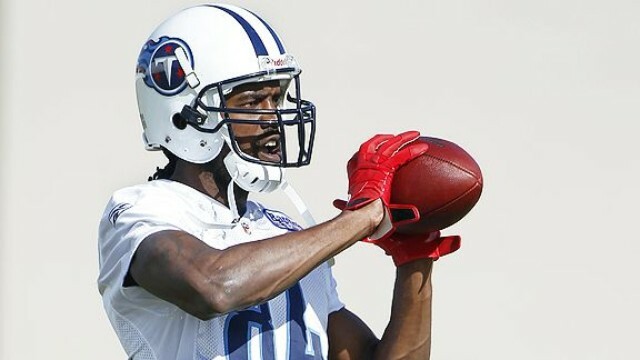 Randy Moss will not be back with the Titans this year. So where will he end up? With not much else going on in the NFL these days, that’s the kind of speculation that fuels the discussion in the football world, and Monday evening’s Total Access on NFL Network began with Jason La Canfora speculating that Moss could return to the Patriots. By La Canfora’s way of thinking, Moss would become more of a team player if he returned to New England because he’ll be humbled by the fact that he was only claimed on waivers by one team last year, and now that team doesn’t want him back. Of course, if the Patriots didn’t want Moss last year, it’s a big question whether they’ll want him back this year. If Patriots coach Bill Belichick doesn’t want Moss, La Canfora thinks Jets coach Rex Ryan might. And then there’s St. Louis, where ESPN’s Mike Sando says Moss could be a good fit because he played for the Rams’ new offensive coordinator, Josh McDaniels, when they were both in New England. Even at age 34 and on the down side of his career, we assume some team is going to make Moss an offer whenever free agency starts. But it says a lot about how far Moss has fallen that the questions are less about how much Moss is going to make in free agency, and more about whether any team wants him. 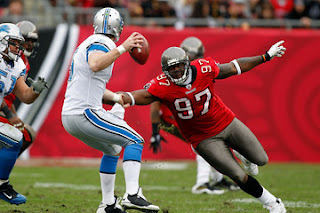 The Tampa Bay Buccaneers have become a quality team in a short period of time. But they also have had a significant quantity of off-field incidents. The latest comes from defensive end Alex Magee, who was arrested on Monday for possession of marijuana and for driving with an expired tag of greater than six months, according to Victoria Lim of Bright House Sports Network, via JoeBucsFan.com. Magee was traded by the Chiefs to the Buccaneers in 2010. He’s the tenth member of the organization to be arrested since January 10, 2010. Over a two-week period, I spoke with a half-dozen players and handful of assistant coaches from both conferences. The picture that emerges is one where coaches and players, despite rules against it, stay in almost weekly contact with one another using a variety of technologies. While lockout rules are supposed to prevent contact between players and coaches, when it comes to the team workouts, both sides are utilizing Skype, e-mail, text-messaging and good, old-fashioned phone calls to update coaches on the progress of group workouts, what players are doing to stay in shape and even personal issues. Sometimes, they simply gossip or talk about the lockout. Think of the irony of talking about the lockout when they're not supposed to be talking during the lockout. It's like talking about Fight Club during a fight. Players privately acknowledge that by engaging with coaches during the lockout they are in a way undermining their own trade association. The players' greatest leverage during the lockout is their particular and unmatched skill set, and if they secretly work with their teams the players are undercutting their own power. They don't seem to care. What was stated repeatedly in interviews is that whichever team stays the most cohesive during this highly divisive fight with owners will have the biggest advantage once the lockout ends. "Eventually we'll have football again," one high-profile offensive player said. "All that matters to me is who is ready and who isn't." Players also say that while they see owners as the enemy, they don't view assistant coaches the same way. The more I hear about the lockout, the less clear the whole mess becomes. It seems like everyone wants football except for the owners and those leading NFLPA at this point. If Carson Palmer means it when he says he won’t be back in Cincinnati, Bengals coach Marvin Lewis thinks rookie Andy Dalton is ready to be the starter. But thinking your rookie quarterback is ready to start is a long way from being comfortable going into a season with a rookie being the only quarterback who can start. 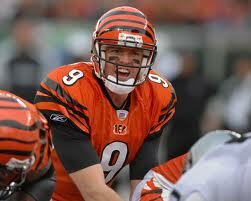 And so the Bengals would like to have at least one experienced quarterback on the team. It’s not quite accurate to say the Bengals have no one who has taken a snap; Carson’s brother and backup Jordan Palmer has thrown 15 passes in his NFL career. But the Bengals don’t seem to think Jordan Palmer is a serious contender to be a starter, even if Jordan thinks he deserves a shot. And so the Bengals want to have someone on the team with experience as an NFL starter. Reedy names Rex Grossman and Charlie Frye as possibilities. Bengals fans, try to contain your excitement. But that’s precisely how a curse can become something tangible. 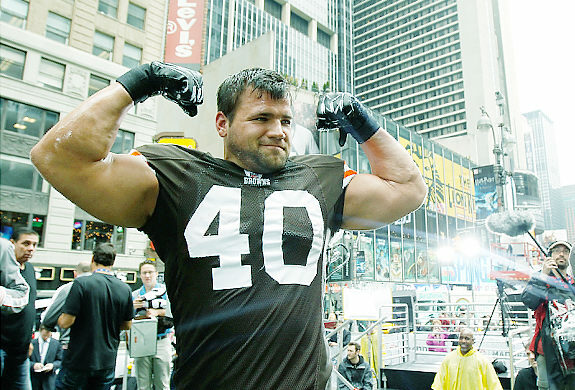 This year, Hillis will be thinking about “prov[ing] everyone wrong,” by not getting hurt. And plenty of guys get hurt when they specifically are trying not to get hurt. So even though there’s no such thing as a Madden curse, Hillis’ desire to prove that there is no Madden curse could, in a roundabout way, become a Madden curse. 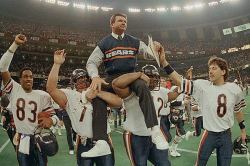 Mike Ditka has been on the labor side of the NFL as a player, and the management side as a coach, and he’s had harsh criticism for both sides since his retirement. So it’s no surprise that he has plenty to say about the lockout currently embroiling the NFL. Ditka ripped Vikings running back Adrian Peterson’s comment likening the NFL to “modern-day slavery,” saying it demonstrated ignorance on the part of today’s players. Ditka also weighed in on the quarterback of his old team, Chicago’s Jay Cutler, saying that the criticism of Cutler isn’t going to stop until he learns to conduct himself the way a leader should. It’s not clear where receiver Randy Moss will play in 2011. It is clear that he won’t be playing for the team with which he finished the season in 2010. Titans G.M. Mike Reinfeldt, in a conference call with season-ticket holders, said Friday that the Titans do not plan to bring Moss back. The Titans claimed Moss on waivers after he was released by the Vikings, less than a month after being acquired via trade with the Patriots. He appeared in eight games, starting four, for Tennessee. He caught only five passes for 54 yards. It’s no secret that Steve Smith wants out of Carolina. Unknown at this point is his next destination. According to Kevin Acee of the San Diego Union-Tribune, the Chargers are “monitoring” the situation. Other possible destinations for Smith include the Raiders and the Ravens. Per Acee, the Panthers quietly were shopping Smith before the March 11 lockout. If/when the lockout ends, they’ll be able to trade him. As Acee points out, the fact that Smith’s contract calls for $15 million over the next two seasons means that he’ll have to re-do his deal before any trade can happen. Brett Favre filed his retirement papers back in January. It doesn’t come as a big surprise he isn’t sure what he’ll do with his life in retirement just yet. “I don’t know. I really don’t know. It could be coaching. It could be TV. Both of those are unlikely anytime soon. 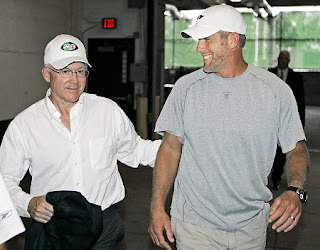 I don’t see myself becoming a full-time coach anytime soon at any level,” Favre told WDAM in Hattiesburg, Mississippi. Favre came out of hiding because he was helping out at a local youth football camp. “I love to be around the kids. Will I get bored at whatever it is I’m doing? I probably will,” Favre said. As he often said last offseason, Favre said he was confident in what he did in his career, implying he had nothing left to prove. He insisted he won’t miss the drudgery of running and training camp. Once the games start, things will get tougher. 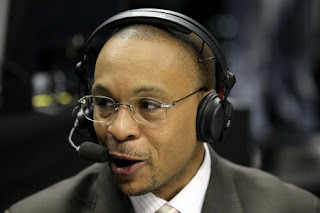 Earlier today, Richard Deitsch of SI.com reported that play-by-play announcer Gus Johnson has left CBS. Raissman reports that, as Deitsch reported, Johnson’s deal with CBS has expired. Raissman reports that Johnson has received an offer from FOX to handle NFL and Pac-12 play-by-play duties. But Raissman also reports that the offer from FOX has not yet been presented to CBS, and that CBS will have one week to match it. Raissman fails to explain whether Johnson is contractually obligated to give CBS an opportunity to match, or whether Johnson is merely shopping the FOX offer. Given the conflicting reports, it would make sense for Johnson or his agent to set the record straight sooner rather than later.